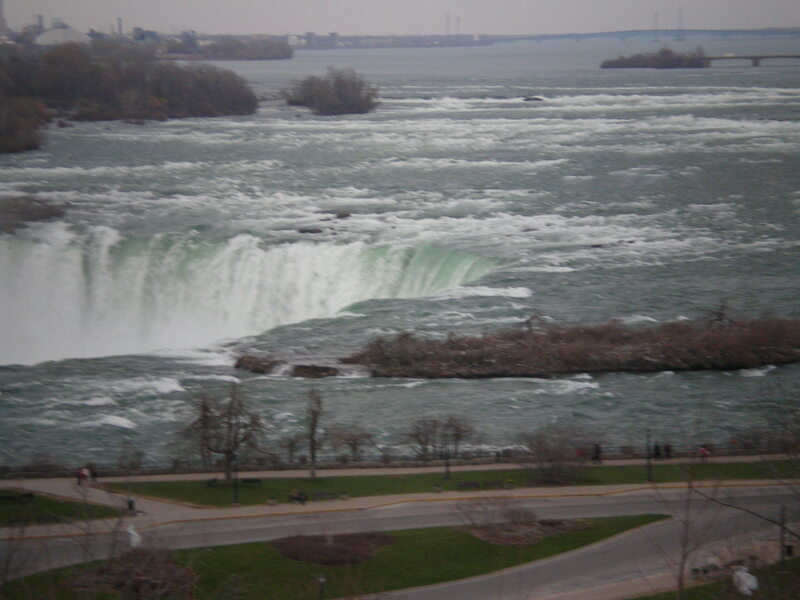 Cely and I went to Niagara Falls in Canada. It was so breathtakingly beautiful! I went to Friday’s for the first time and fell in LOVE with it. Now I eat it all the time. The first day there, we walked down into town and looked for some place I could get service in order to do my homework. I know, on vacation and doing homework…that such waits for no one! Wish I knew then what I know now. But whatever. Our second day we walked down into the town for a fun day of sightseeing. Walking into the Scream Factory we met a really nice guy, it was about 10 am. We bought two tickets and walked into your average haunted house…or so we thought. I pushed that red button and from that point on, thought I would die of a heart attack. It was pitch black in there! And Cely, my wonderful, funny, sarcastic Cely was like a limp rag doll on my arm! All we had were these red lights to show us the way, meanwhile things with claws and chain saws were grabbing at me (because Cely was by the wall, nice and safe). At one point, the red light went off and we were surrounded by wall and no exit. In the beginning, before going in, they give you a safe word…I was this close (imagine my thumb and forefinger almost touching) to screaming the word and giving up. And then, while taking a deep breath, a car came at me! A FREAKING CAR!!! Yeah, there’s a nice picture of me looking like terrified. After that, it was crawling through a tunnel (Cely finally had to let go of my arm and open her eyes), and walking over a bridge…in pitch black darkness, don’t forget. By the end, we were practically running out of there. BUT, we made it all the way through without giving up, so HA! There was Ripley’s Believe It or Not Museum, Madame Tussaud’s Wax Museum and a few other things thrown into the mix. Finally, we headed towards the Falls and spent some time watching the water run down. We were so close to the edge that we were literally soaking wet in five minutes. It was glorious!